Diabetes and high blood pressure have been found to occur together in up to 75% of adults while patients with high blood pressure alone frequently show evidence of poor glucose metabolism a situation designated as insulin resistance. There is now strong evidence that specific diseases like obesity and mental stress could provide strong connection between type 2 diabetes and high blood pressure by sharing common pathophysiology. This means that the existence of long standing high blood pressure will establish the proper conditions for diabetes to appear and this procedure will become accelerated by the presence of even mild obesity. For the above reasons the prevention and treatment of these pathological entities often requires a common strategy in lifestyle changes, eating habits and medical intervention. One of the most common treatment approaches to the newly diagnosed hypertension in conjunction with diabetes includes radical modifications in almost every aspect of your lifestyle. 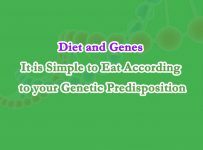 That is because the familial predisposition for both type 2 diabetes and high blood pressure, is determined by a large group of genes which, although they act cooperatively to produce these disorders, each one alone has its own minor effect. 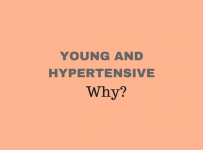 So it appears that your hypertension is a matter of many different things put together: basal metabolic rate, fat deposition, glucose intake relative to your body metabolic capacity, elasticity of your blood vessels and many other constitutional characteristics. Here are some points to consider if you are dealing with the risk of having both conditions. Medical conditions that necessitate or impose inactivity: as for instance different types of arthritis, functional disabilities, musculoskeletal disorders. All of these conditions make difficult to exercise regularly. Seek for alternatives to common gym exercises like limited mobility fitness programs which include: Cardiovascular exercises, Strength training exercises and flexibility exercises. Discuss with your doctor and physiotherapist which type of exercise you are allowed to adopt. Collagen and autoimmune diseases: These may affect the quality of blood vessel wall as well as liver and renal functions leading to high blood pressure and glucose intolerance. Such conditions include systemic lupus erythematous, systemic sclerosis, rheumatoid arthritis and certain autoimmune endocrine diseases. Because this group of diseases are chronic conditions, with frequent outbreaks and remissions, regular medical consultations are necessary. Sleep apnea: Apnea occurs when your breathing is interrupted for few seconds to several minutes during sleep. 80% of people with Type 2 diabetes suffer from sleep apnea. Psychological conditions: Mental stress may affect circulatory and endocrine systems negatively. Stress generates sudden increases in blood pressure usually of short duration. But chronic anxiety and depression frequently trigger certain behaviors like overeating, increased alcohol consumption and bad sleeping habits which, if long standing, will have a strong impact over blood pressure regulatory mechanisms and glucose control, resulting in hypertension and diabetes. Endocrine disorders: Blood pressure and blood glucose is regulated by certain types of chemical substances that are released in response to various stimuli either from body itself or from the outside environment. These chemical substances are called hormones are released from glands and constitute a broad communication network between the body organs. Type I diabetes is a kind of endocrine disease that appears when pancreatic gland fails to release enough insulin to burn the ingested glucose. Type I diabetes, especially if uncontrolled, can cause severe damage to the tiny muscles and internal lining of arterial walls. As a result they begin to lose elasticity and become stiff and unable to accommodate changes in blood flow (i.e. exercise, stair climbing, mental stress). Eating habits: Food quality and preparation are the two major points to consider in order to achieve a substantial modification of your diet. Chemically processed food like fast food and canned or precooked foods contain a decent amount of sugar, salt and lots of preservatives. These ingredients make processed food very rewarding to your brain, by compromising its satiety-control mechanism, resulting in increasing food consumption. Method of cooking: If you prefer to avoid precooked or fast food and you opt for preparing home made meals, keep in mind that no matter how fresh and healthy are the ingredients you add, cooking could destroy completely the nutritional value of food and increase its fat content enormously . For instance fried vegetables, sautéed or over grilled meats, fried oils, sour cream and sweetened fruits may not be a healthy nutritional option anymore. Exercise: Keep it simple. It is not so much about the complexity and duration of exercise as is for consistency and persistence. Opt for some simple exercises that you think you will be able to perform and add them to your daily schedule. It is advised to fix the same hour every day and wait at least for 2 hours after a meal before start to workout. Evaluate regularly your blood pressure and blood glucose without becoming obsessed: Blood pressure and blood glucose have normal daytime variations depending on your activity and the timing of measurement. The accuracy of readings depends upon the timing of measurements. In order to obtain relevant numbers you need to be consistent with the time of measurement that is important to be the same for every day and to obtain the readings in sitting position, after 15 minutes of rest. Blood glucose check is better to be done in the morning, before breakfast and also 2 hours after a meal if you are diabetic. 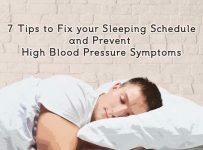 Do not waste your sleeping hours: Normally during sleep both diastolic and systolic components of blood pressure drop. Sleep deprivation and insomnia appear to be linked to high blood pressure and poor glucose control particularly during middle age.Some bad habits that could disrupt your sleep are prolonged screen time before going to bed, heavy dinners, eating just before going to sleep (in particular if you suffer from indigestion or gastro esophageal reflux) and consumption of caffeinated beverages or chocolate. Choose to snack smart: A good habit for office snacking is to carry your own home prepared healthy snack. This could be some bread (or rusks) and cheese, raisins, nuts, cereal biscuits, sandwich with boiled egg and tomato and other clean food combinations. If you don’t have time to do this, or you are outside with friends, you can still make a smart choice from the fast food restaurant menu: a small vegetable salad, a fish burger, some turkey and cheese sandwich or some unsalted fries and a lemon juice or a coke are a better alternative to club sandwich, hamburgers and various stuffed pies and milkshakes. Do not miss your annual check up: A health check is never a waste of time. Diabetes and hypertension may affect people of any group age with prevalence. Be more consistent with your checkups if you have risk factors such as smoking and obesity or family history of heart disease. Drink plain water: Plain water with lemon or soda water is a good way to hydrate your body, avoiding the harmful effects of carbonated beverages or energy drinks. Discuss your problem with friends and family so that they do not insist on what you must avoid: Family dinners or Sunday brunches with friends usually contain a variety of carbohydrates and many food combinations which you may want to avoid. If they know your problem it is more likely for them to be supportive and you will be more comfortable with your food choices. Bran cereals with milk substitute (coconut milk, almond milk) or zero fat milk.